While Karl is very active, staying fit by walking and working out at the gym, you can also find him covered with dogs in his Lazy Boy chair at home! Karl and his wife, Rosemary, are involved with the Meridian Animal Shelter and Fuzzy Paws rescue. In fact, two of their three dogs are rescues. Their dog Lily was adopted by them at age 13. They could not stand the thought of her pending fate in a Northern Idaho shelter, so they went and got her. She hit the jackpot. Karl and Rosemary spoil their dogs with love and great care and affection. Karl takes his job as a pet sitter very seriously. He is very attentive and concerned when things are not quite right. 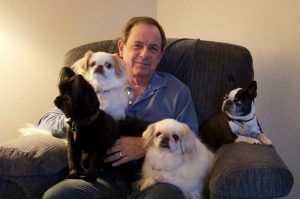 He is a great communicator and always keeps us and the clients posted on their pets. Karl’s favorite jobs involve caring for senior dogs. He caters to their every need. Karl is trustworthy, dependable and compassionate. He is a great asset to our team!